I've referenced a little LA Scotch Club event a couple times this week. It's called Springbank Spring Break. It used to be an annual event, but then whisky prices soared, making the event more challenging to arrange. Andy, the head of the club, was able to pull one together in 2016. It was a hell of a thing, and my final LASC event before moving to Ohio. There were many great whisky opportunities to be found at the event, but picking up a full sample of this whisky may have been the highlight. I'm skipping the stats section because all the pertinent info is in the pics above. 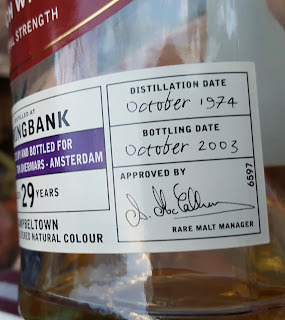 In 2015, I experienced a 30 year old 1972 Springbank from Chieftain's that was possibly the best single malt I've ever had. That one was from a bold sherry cask. This one is from a hogshead. So they're different creatures. Still, though. Excitement! Its color is medium gold. The nose starts with peaches, mango and butterscotch. Then the oceanside, roses, cherry candy and some warehouse funk. A small whiff of struck matches lingers. With time, that sulphur note grows and a dried grass note arises. Still there are new moments of chocolate malt and apricot jam. The palate's first notes are of cocoa, vanilla bean and clementines. On the succeeding sips there's ginger beer, a little bit of smoke and tart berries. With time, it grows maltier and bitterer. Bitter chocolate, bitter herbal liqueur. It finishes with butterscotch, mango and malt. Sweet. Slight ashy tobacco note. With time, the sweetness calms down and hints of bitterness and vanilla ease in. The whisky gets remarkably cloudy with very little water added. The nose mellows out. The sulphur vanishes. Fresh flowers and fresh fruit. Butterscotch. Brief farmy peat. The palate continues to get maltier. There's some toffee, apricots, limes and clementines. A mild bitterness balances out the sweetness. Mild metallic and peat notes. Some brine and ash in the finish. Some bitter chocolate and fruity sweetness merge. 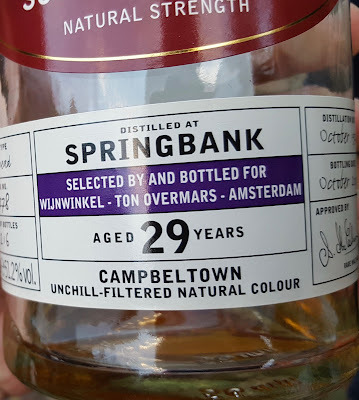 This isn't the friendliest Springbank around, but if you like a little bit of good sulphur and an herbal bitter bite to your whisky then I think you'll get on just fine. 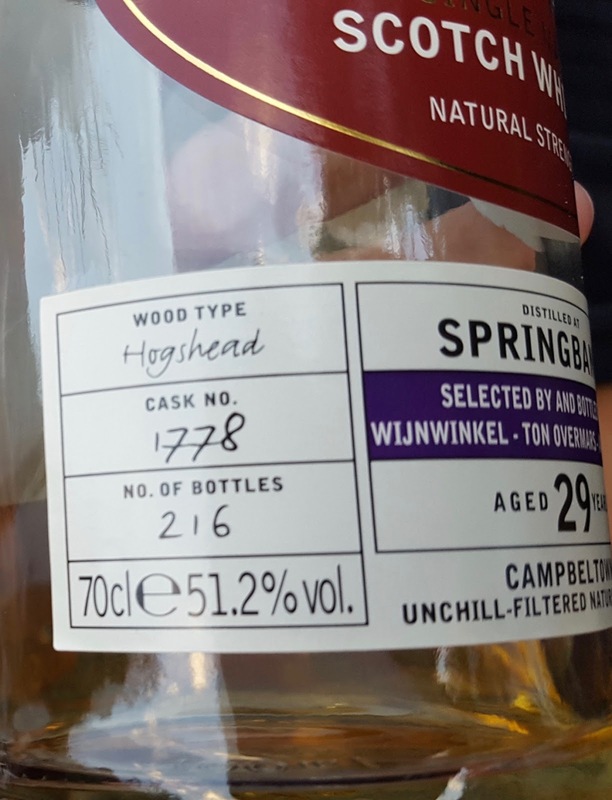 The amount of sulphur is a bit curious considering that this was likely an American oak hogshead; perhaps those notes came from the spirit itself. The fruit notes are nice and there's an impressive maltiness for something its age. While its kinks get straightened out when water is added, I think I preferred its quirkiness. Though it is very good whisky, it is bettered by a number of recent (and MUCH cheaper) Springbank releases, and falls considerably short of the old sherry cask Springers I've tried. --The whiskybase community is nutso about it. --Serge, also has a comparable opinion, though slightly less positive.